As the weather gets hotter here in Spain, I immediately long to escape to my native Scandinavia. 45 degrees Celsius is not a temperature we Vikings generally thrive in, at least speaking for myself. Last year, it got so bad that I suggested that my husband and I look for a volunteer job protecting icebergs on Greenland for the months of July and August. No offers came. This year, I booked my trip in the early spring, arranging to spend part of July in the refreshing north. Then came May. While we in Andalucía had downpours and freezing nights, Norway experienced an unseasonal heat wave. We still hadn’t put away our winter woollies in Ronda, as Oslo’s temperatures exceeded 30 degrees and they could boast of being the warmest capital in Europe. Things cooled down a bit in June, but by July, when I left for northern latitudes, it was basically as hot there as in southern Europe. Pity Scandinavians who had booked their annual trips to bask on the Costa del Sol, as their neighbours back home would get just as tanned, with less crowded beaches and cleaner water. 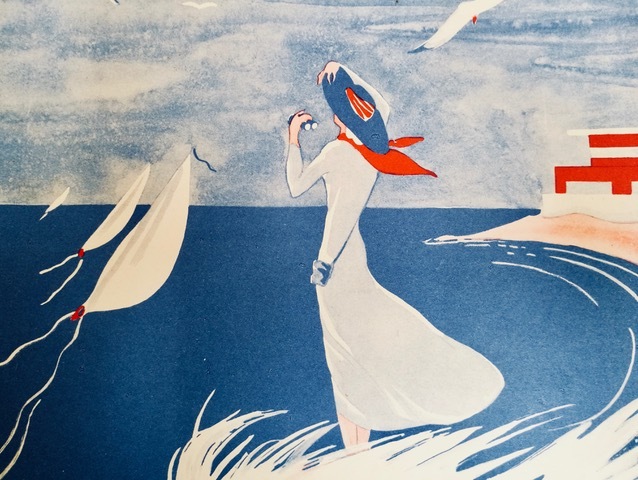 I can say one thing for certain about my country fellows – we love immersing ourselves in seawater for any occasion, practically all year long. 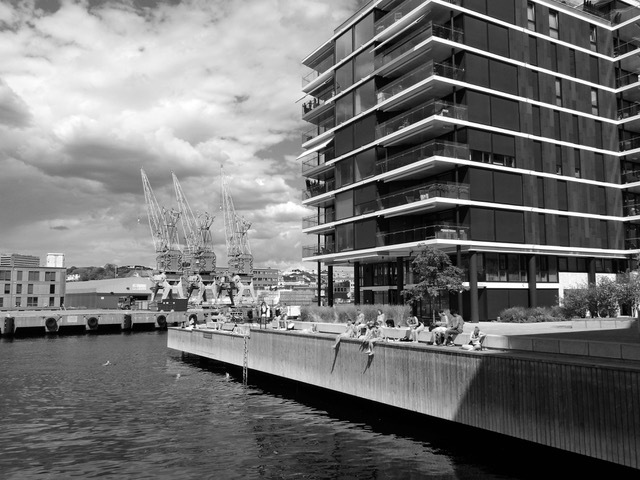 The Norwegians fondness for the ocean blue hit new heights this summer, as I saw people diving in right downtown Oslo harbour and then plopping down to soak up some rays on any available piece of grass, terrace, pier or even public boardwalks. I too jumped in from my mother’s fjord flat, where environmental programs have made the water cleaner than for the last fifty years. The only one who didn’t swim was my mother. Granted, she will be 88 this fall so she does have a valid excuse, though age doesn’t seem to stop some of the old keeners in her building. I tried to convince mom to join me, but she declined, preferring to enjoy the sea from the safe distance and comfort of her terrace. One evening, after my 5th dip in the fjord, my mother told me how she learned to swim. I have heard her stories my entire life. In my younger days I listened with half an ear, not really that interested. Lately, I have paid more attention, as I know that she might not always be there to share them. Her stories have become increasingly precious to me and I consider them the greatest gift she can share with us, her offspring. This one, a story from 1944, was one I had never heard before. My mother was born in 1930. 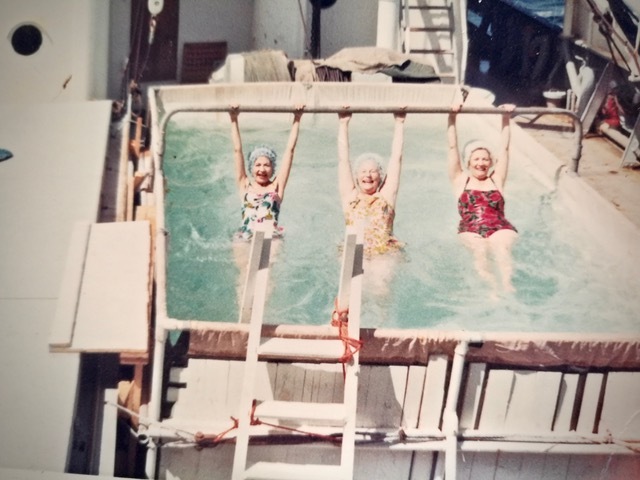 Since my maternal grandmother was paranoid of the ocean, thinking one could drown by merely looking at it, my mom would never have been allowed to wade in above her ankles as a child. Therefore, at the start of the Second World War, mom still didn’t know how to swim. 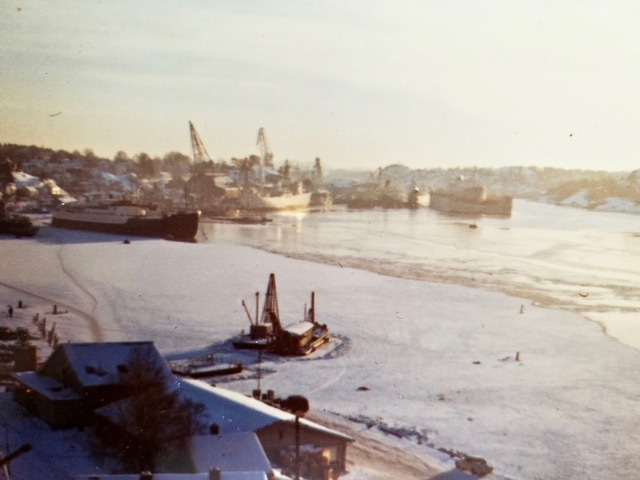 She was almost ten when the German’s invaded Norway in the spring of 1940. For the years to follow, she dreamt of owning a bicycle, so she could bike to one of the bathing spots along the fjord in the summer, but she had to wait several years after the war (there was rationing into the 50’s) before she got her first, well-used bike. Thus, life wasn’t exactly a beach. During the war, everything was rationed, from milk to petrol to fabric. While fashion styles got increasingly less voluminous due to lack of materials, the clothing stamps the families received were used for essentials, or traded into food stamps. As things got scarcer and scarcer, flower gardens were converted into potato fields, shoes were made from salmon skin and old curtains became the only way of having a new spring dress. 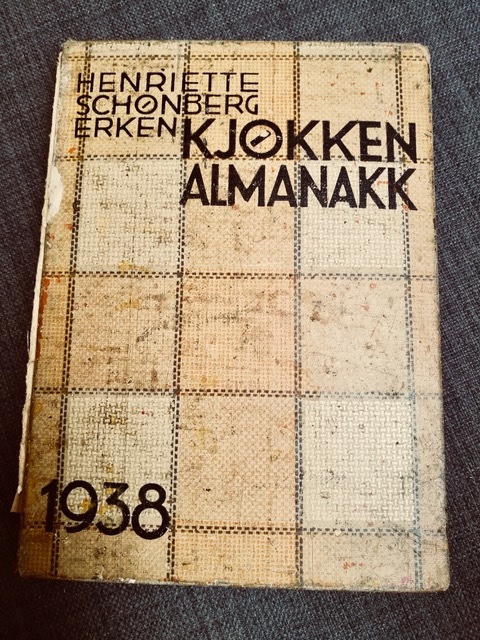 I still have my grandmother’s tattered Kitchen Almanac from 1938, which she not only used as a cooking diary during the five years Norway was occupied, but also scribbled down her annual production of homemade black current jam and her Christmas baking all the way up to 1985, merely a coupe of years before she died. The almanac is a true testament to her generation’s thriftiness. When my mother prepared for her confirmation in 1943, clothing stamps were saved for months so the families of the confirmed teens could communally purchase a roll of fabric, enough to make a cloak for each. Compared to the fortunes spent on dresses, gifts and parties today for confirmations or the Spanish equivalent Spanish, la Primera Comunión, the class of 1943 had a true confirmation of faith. As the war continued, my mother still didn’t know how to swim, that is until the gloomy summer of 1944. It was decided that all students in town had to know how to swim and that those who didn’t were to be given swimming lessons. Basically one had no choice in the matter. Even with my grandmother’s protestations, the kids were going in, come hell or high water. Needless to say, my mother didn’t own a bathing suit. Such a frivolous luxury item wasn’t readily available, even if one had the money or the stamps to purchase one. During the war, mom had shot up and was at this point the tallest girl in her class, and having far surpassed even the lankiest of the boys. My grandmother, on the other hand, was a tiny woman. So when a bathing suit had to be found for the obligatory swimming lesson, mom had no other option than to borrow her mother’s by then probably dated, ill-fitting swimsuit. In addition to the perils of war, the lack of food, the fear of bombs and Nazi traitors, the ‘war summers’ as my mom calls them, were also freezing cold. The students were asked to show up on a beach in the in inner harbour. Mom needed to walk through the town to get to the lesson, surely not thrilled at having to learn to swim together with children who were much younger than herself. By then, she had started walking hunched over to appear smaller, so German soldiers wouldn’t bother her. 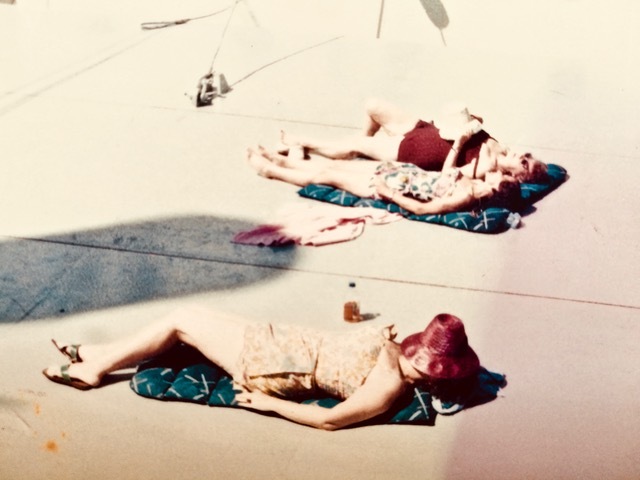 Understandably, I have no photos of mom from this time, as cameras and film rolls were only for the privileged few, but I have dug out some bathing fashion from the era to set the mood. The ‘beach’ the students were to meet at was not a beach in today’s sense of the word. First, our town was then an important industrial centre, known for its shipping, whaling and petroleum industries. Even 30 years later, when I was a kid, the inner fjord often looked like a zest pool. Secondly, there would likely have been German war ships in the harbour with guns and canons facing in every direction. Third, the beach would contain more boulders and sharp rocks than course sand, many likely covered with oil slicks. The water would also have been floating with seaweed, in addition to an assortment of the three species of jellyfish we used to have. I can just imagine the scene – a handful sporty male gym teachers and several dozen pale, skinny children in borrowed bathing suits having to enter that water on a cold, grey summer day in 1944. 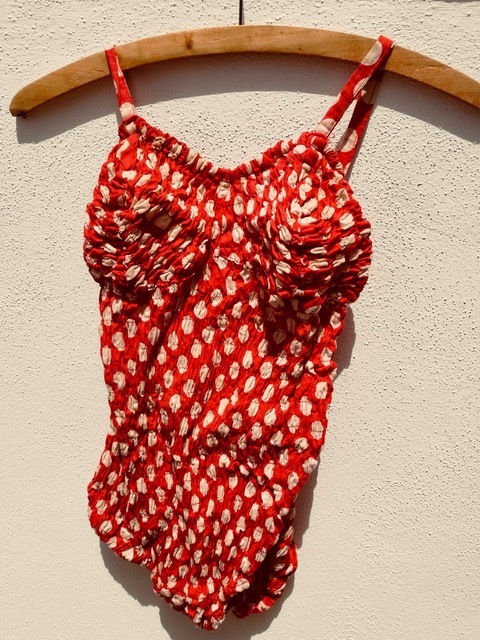 Many years later, when we were cleaning my grandparent’s house and emptying their attic, I found one of my grandma’s old bathing suits. It was a threadbare curiosity that nobody in the family except myself would even dream of saving. Back to Andalucía after returning from my trip, I went looking for it. Maybe it wasn’t the same one my mother learned to swim in, but there it was. 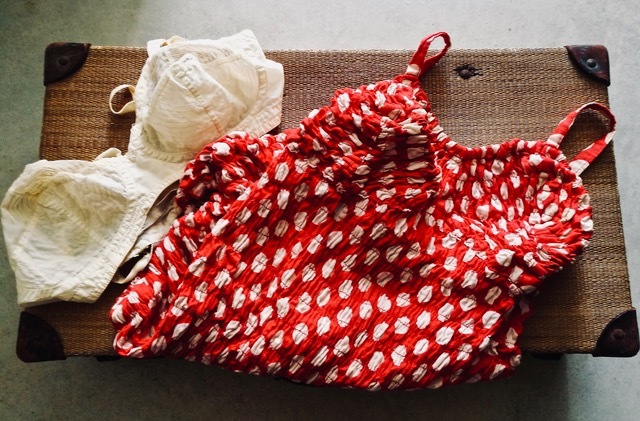 Kept as a time capsule in an antique valise, together with a hand-sewn bra from the 30’s, a threadbare Charleston dress from the swinging 20’s and a few other things that remind me of my stylish little grandma. My mother did learn to swim in spite of the odds, tied with a rope that was attached to a pole held by the teachers (I believe my dad tried the same method on us kids a few decades later…) yelling instructions while the student’s teeth were chattering. Can I blame my mom for not loving the sea?